The Northern Territory offers some spectacular fishing spots. And the best part is these are all dotted along some scenic coastline unlike anything else on this planet. We want to show it to you because we know our charters create an experience and holiday to remember! Humbug Fishing welcomes all enquiries and looks forward to assisting you with your extended fishing charter. Please use the form below or our direct contact details to secure your spot and help us plan an unforgettable trip for you and your mates, family or colleagues. There are a few conditions that you will need to be aware of when booking with Humbug Fishing. Cancellation fees do apply and a 100% cancellation fee applies if you fail to board the vessel. If we have to cancel the charter due to weather conditions, we will reschedule or refund your payment. The Skipper has absolute discretion. 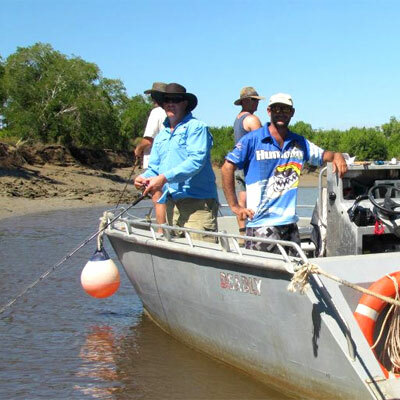 Bring your favourite rod, reel and lure to test out the superb Northern Territory waters! But we do have all your tackle needs taken care of.